Apply online and your card will be sent your door. The OPTIMUM card costs £5 and you can pay using a credit or debit card. Watch our animated explainer video highlighting the benefits of using the Optimum card. After activating your card and registering, you’ll be able to load your card, manage your account and check your balance. 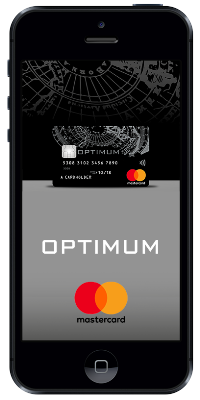 Manage your money on the move with the Optimum card mobile app myOptimumCard. Benefits of the app include allowing you to view your balance and transactions, load funds and set alerts. Your app is protected by a passcode and we’ll never store any of your financial details on the phone. *We are legally required to confirm your identity when we receive your application. As long as we can do this, you will receive a card that allows you use all the great stuff Optimum has to offer. If we are not able to fully confirm your identity, you may receive a card that still lets you shop everywhere in the UK, but which has limited functionality. The Optimum Prepaid Mastercard® is issued by PrePay Technologies Limited pursuant to license by Mastercard International Incorporated. This card is an electronic money product. PrePay Technologies Ltd, is authorised and regulated by the Financial Conduct Authority for the issuance of electronic money (FRN 900010). Mastercard and the Mastercard Brand Mark are registered trademarks of Mastercard International Incorporated. © 2019 Optimum. All rights reserved.